The reading focuses on the rich young man at the moment when he asks Jesus the secret to “eternal life,” or, as we understand it, a life grounded in the eternal. The young man is enthusiastic about following God. He has heard about this new itinerant teacher. People say that he makes the lame walk, the blind see. People say he has the secret to eternal life. When the teacher comes to his town, the young man is excited. He goes to the teacher and kneels before him and asks his question. “Teacher, what must I do?” But the answer stops him cold. Now he is frozen, indecisive on whether to move forward or backward. Whichever way he moves, he will never be the same. 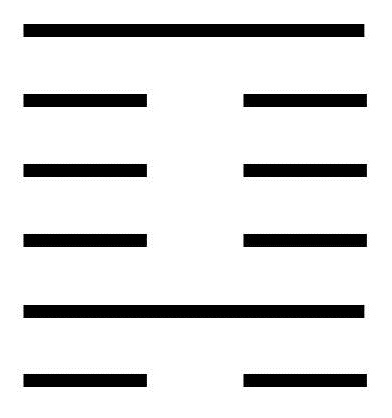 The upper trigram is Stillness, and the lower trigram is Chaos. The image is motion caught in confusion and stopping on the brink of chaos. This is the state of mind of the rich young man in the reading. To recognize that youth lacks wisdom and needs to learn from others. To seek a wise guide, and for that guide to give clear teachings that are grounded in God’s Wisdom. To understand that it is the student’s place to seek the guide, not the guide’s place to seek the student. To refrain from asking repetitive questions that annoy the guide, and, if the student persists, for the guide to respond only with silence. A moving line in the bottom position further cautions on the inexperience and carelessness of youth. Youth must be educated on the seriousness of life and the need for discipline. Discipline begins with rules and laws. Without discipline, little can be accomplished in life. But discipline must seek to enlighten and not to suffocate with mindless repetition. A moving line in the second position evokes an image of a wise one who has no external power but great character. A wise one treats the weaker and less experienced with kindness and love. Inner strength combined with modesty are traits that serve well in directing others and achieving goals. A moving line in the third position warns one who is weak, inexperienced, and struggling to make a name not to lose one’s way and to become attached to false idols. There is a temptation to follow a stronger personality and sacrifice one’s integrity. This will cause great loss in dignity and serves neither party well. Be true to self and to God’s calling. A moving line in the fourth position warns youth that it is easy to be sidetracked by flashy but false idols. The rich young man was enamored of his wealth. The more Ego clings to false idols, the more difficult it is to hear Wisdom’s voice. Great inner discipline is required to keep Ego in check. A wise teacher may need to resort to humiliation to put Ego in its place so that real discernment can occur. A moving line in the fifth position advises the inexperienced one to set Ego aside and seek instruction from a wise teacher in an unassuming and childlike way. A moving line in the top position advises that it is sometimes necessary to punish wrongdoing. This punishment should never be done in rage; it should be directed at correcting a specific problem and guarding against unjustified excesses. The punishment itself must be appropriate to the transgression. Discernment is required to understand the necessary degree of punishment. Punishment can be a means of restoring balance but, if left to Ego, it can also become a path to tyranny.